Belt guide urethane wheels last longer than the rubber wheels, this is due to the strong characteristics of urethane which makes it the best choice over rubber and plastics. Plan Tech manufactures belt guide urethane wheels that can withstand wet and dry environments. More so, we deliver world-class products when it comes to the manufacture of urethane related products and machinery. Plan Tech makes use of 100 percent urethane in the manufacture of all equipment and products. Our belt guide urethane wheels are designed by experienced engineers to help you in the workplace and its environment. 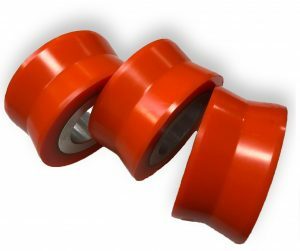 Belt guide urethane wheels are used in the assembly, material handling and manufacturing operations industry. Plan Tech carefully select only quality material for the manufacture of belt guide urethane wheels and other urethane related products. Plan Tech belt guide urethane wheels provide durability, improved strength and corrosion resistance over belt guide rollers made with rubber. The presence of urethane reduces the chance of severe belt damage due to roller wear causing Sharp edges. The production of metal parts can be very expensive, and the reason is that, unlike urethanes that can be casted easily, the casting of metal parts cannot be done without the process of welding and the use of machines. Are you interested in Belt Guide Urethane Wheels? Please Contact us so we can help solve your requirements and work with you on your specific application!